Linn Sneaky DSM comes to you at a pretty sneaky price point too! Now that we’ve looked in closer detail at three of the music players in the Linn DSM range, it’s time to inspire you with the benefits offered by the Linn Sneaky DSM. Sneaky has always been one of the most affordable of Linn’s music players (see our blog post on the DS version), but that certainly doesn’t mean it skimps on quality. In fact, its popularity is driven not by its price but by the fact that it’s incredibly adaptable. Plus, it goes one better than its DS cousin by being able to play music, movies, and console games with exceptional sound quality. 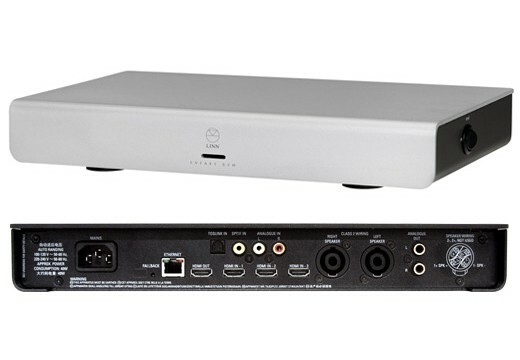 If you’re seeking an all-purpose digital streamer that can be easily accommodated by any room in your home, no matter how small, the Linn Sneaky DSM fits the bill 100%. In fact, it can even bring sterling quality sound to multiple rooms and outdoor spaces, such as patios and gardens, when you expand it using additional amps and speakers. Using its fully integrated pre-amplifier and power amplifier, HDMI, S/PDIF, Toslink, and RCA Phono inputs, the Linn Sneaky DSM can stream a myriad of music formats over your Ethernet network. So, whether you’re looking to relax with your favourite podcasts and internet radio stations or listen to your Spotify playlists with friends, Sneaky’s more than ready to indulge you. You can also connect it to your TV, games console, Sky/Virgin/Freeview box, and Blu-Ray or DVD player to make watching television programmes and movies an experience you’ll never forget. All you need to get started is a pair of speakers, and the Rococo Systems team are happy to advise you over the phone, via email, or in-store at our London or Essex office on what type of loudspeakers will help you get the best out of your player. Because the Linn Sneaky DSM comes with in-built Space Optimisation technology as standard, its surroundings won’t cause it to lose any of its superb sound quality whatsoever. The player uses Space Optimisation to build a virtual picture of the layout of your room, its contents, and its unique characteristics, allowing it to reduce the frequencies that can be artificially distorted by its surrounding environment. This results in a pitch-perfect, smooth audio performance on every single occasion. At Rococo Systems, we’re proud to be authorised Linn dealers and experts in our field. You’ll find purpose-built listening lounges at both our Essex and London stores, which are where we hold pre-booked demonstrations for our customers. In our opinion, it’s the best way to hear the unique sounds of Linn’s DS and DSM products and decide which system is the perfect one for you and your home. We don’t charge a fee for demonstrations, but we do ask that you book them with our team in advance. You can do this by calling us on 01277 890 888 (Essex) or 020 7454 1234 (London) or by filling in our online demonstration request form. Discover the power of Sneaky today! Call us now to book your free demonstration or find out more about how you can trade-in your existing audio equipment to make becoming a Linn Sneaky DSM owner even more affordable.